Last Autumn I acquired some medlars. I had no idea what to do with them, just a fascination with these fruits that you needed to rot before they were ready to use…I think my original plan was to make medlar cheese, but when they had bletted (rotted) there were not really enough of them. So I made a confit by bletting them, squidging them into a pan and adding an equal quantity of honey, then boiling up till I had something approaching a medlar jam or confit. It tastes fabulous. Earthy, sweet and spicy. But where does it belong? If I was in any way a baker I might make a sourdough bread, but I’m not! So using it alongside game was an obvious way forward. I’ve used some with roast pheasant. But, that’s out of season now and I still have half a jar left. I made another Abel and Cole order this week and decided to risk pigeon. It’s something I’ve eaten in restaurants and really not enjoyed, and something that we never ate as a family because my mum regarded pigeon as vermin…so, for me this was outside my comfort zone. But, why not? one of the advantages of cooking for yourself is that no one else gets to suffer if the dish is disgusting. 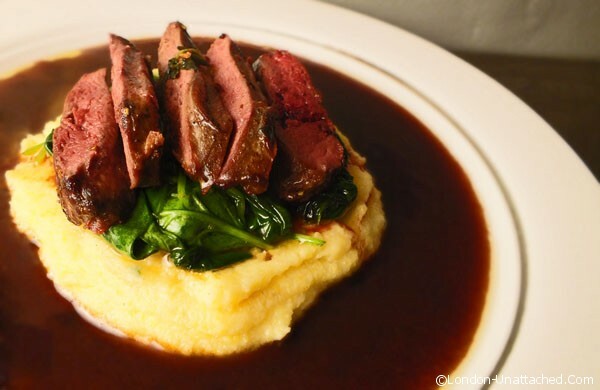 This is my second attempt at Pigeon breasts with red wine and medlar jus, which I served with polenta mash and wilted spinach and it’s a recipe that has improved with a little practice. At least an hour before you plan on cooking, marinade the pigeon breasts in oil, juniper berry and thyme. If you have less than 2 hours, do this at room temperature, if you have more than 2 hours you can place the meat and marinade in the fridge and remove about 30 minutes before you want to cook. Add the medlar confit and season with salt and pepper to taste. You can now put this to one side till you are ready to cook the pigeon. Reheat the Jus if necessary and plate. So, I am now a pigeon fan. Game that is available all the year round, 6 pigeon breasts (enough for three servings) are currently priced at £5 from Abel and Cole, so extremely good value for money. And, of course, like any convert I am now an advocate. Pigeon breasts are tender, well flavoured and really worth trying. So have you tried pigeon breast yet? I don’t mind eating them, I don’t like them flying around though, had a bad childhood experience in Trafalgar Square! Your dish looks delicious. I did too, not in trafalgar square, but when I was about 21 in Russell Square, where they tried to eat my lunch! I know you are a medlar fan Karen, I seem to remember you and I first started talking about that WAY back!